(NewsUSA) – Marco Polo fell in love with it. Poets and painters captured its beauty. 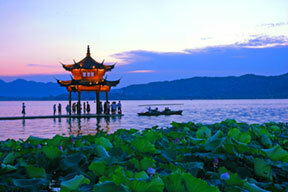 Even ancient emperors were awestruck when they visited Hangzhou. The official tea harvest season in Hangzhou from spring to summer gives visitors to China the perfect chance to discover that the country has more wonders than just the Great Wall. Like San Francisco, Hangzhou is a city by the bay. Like New York, it has world-class museums and cultural activity beating around a heart of green space. Like Venice, its houses are lapped by the gentle currents of a canal. The region’s hand-produced Dragon Well tea comes in many grades and varieties. But the only version considered genuine is grown in villages and plantations surrounding Hangzhou’s fertile West Lake. The West Lake is so photogenic, locals believe a dazzling pearl fell from heaven and transformed into the serene body of water, surrounded by rolling hills replete with tea houses, temples, monasteries and museums. Must-see attractions include the Six Harmonies Pagoda, Two Peaks Embracing the Sky, Temple of Soul’s retreat, Peak Flown from Afar and Solitary Hill. The official tea harvest from spring to summer is the best time to visit Longjing (Dragon Well) Village, home to the National Tea Museum; the only one of its kind in China. International tourists can experience a tea art performance, learn about tea-growing and the various tea ceremonies that reigned or still reign in China — and, of course, drink tea. There are two wonders in China: one is the Great Wall, and the other is the Grand Canal — the oldest and longest man-made canal in the world. It stretches 1,200 miles from Hangzhou to Beijing and has stood the test of time for more than 2,000 years. An engineering marvel comparable to the Great Wall of China, the Grand Canal incorporates 132 heritage sites (seven of which are in Hangzhou). The popular saying in China — “Above is paradise, below is Hangzhou” — illustrates the characteristics of the “heavenly city” and Impression West Lake, which presents the local history and culture by exploring the beautiful landscapes, folk lore and myths of Hangzhou, such as the Legend of White Snake. Impression West Lake was created by the people behind the opening ceremony of the Beijing 2008 Olympic Games. Xixi National Wetland Park is the only national wetland park in China. The wetland has a history and cultural heritage of more than 1,800 years and is the original site of Chinese South Opera. It is home to traditional Dragon Boat races and vivid life of a water village, including silkworm feeding and silk production.